However, I've always felt that it was too bulky, heavy and complex for me. Most of the time, I'm reluctant to bring it out especially on formal family gatherings. I didn't feel motivated to use or practice with it. It bothered me when I see my family's sad faces whenever I use it and take longer than 5 seconds to take my food shots. The size, weight and bulk made it difficult to move around the table. And, the lack of LCD screen because it was an old model limited my angles. My brother has long been urging me to get a good point and shoot instead. For the past few months, my view finder doesn't seem to be as clear. I had it assessed with Canon Philippines and the estimated cost was 8,000 php for repair. Of course, I figured it wasn't worth it so I still used it. Taking too long (longer than usual) to take my photos, my mom offered to gift me a new camera. Of course, I was so thrilled, happy and excited. My brother and little sister, who knew more about photography than I did, accompanied me to Camera Haus SM Manila to buy. I wanted to check out the Sony RX100 Mark II which was a good but easy to use point and shoot that brother has always suggested for me. But, I felt that I didn't want to be too restricted. 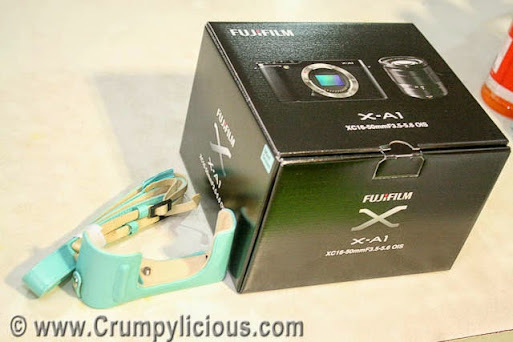 The next options were the Samsung NX which brother had and lost (didn't want to have the choice as him! 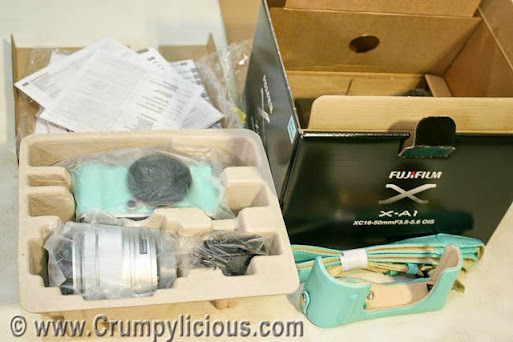 ), Sony NEX and A series (which was expensive) then finally the Fujifilm X-A1 (priced at 21,990 php) which was so trendy in mint green and orange colors. The staff took it out for testing. Brother tested it and told me it locks on the target and focuses fast but he couldn't focus on very near objects so he doesn't approve of it. The staff commented that it has to be equipped with macro lens to work. I persisted buying it outright because I liked the color. =p It came with a matching mint green neck strap and leather casing. It also has a free Transcend Class 10 8gb SD card. I read the manual as soon as I got home! And, I found it easy to use because it had helpful meters so you know the aperture, ISO and focal distance. It has various focus modes as well which is still new to me. It also comes with a WiFi function so I can sync it with my phone and upload the images in Instagram. If you're my follower in Instagram, I bet you've seen the drastic improvement on image quality on my latest uploads.